White blouses (or shirts, if you prefer) seem to occupy a niche all to themselves in the annals of fashion. There is something both unpretentious and elegant about a white blouse. A white blouse is almost always noticed and admired, and even the most tailored white blouse has an air of femininity to it. Here is what Christian Dior had to say about the color white when he wrote The Dictionary of Fashion in 1954: “White is pure and simple and matches with everything. For daytime it has to be used with great care because it must always be really white and immaculate… But nothing gives the impression of good grooming and being well dressed more quickly than spotless white…” (Published again in 2007 by Abrams, New York, New York; page 120). What could be a better example of being well dressed than this white blouse featured in the February/March 1955 Vogue Pattern Book Magazine (page 28)? With its tucks and French cuffs, it is both demure and sophisticated. Now this is an elegant blouse! This is an advertisement for Crompton velvet, featuring a Vogue pattern (Yves St. Laurent evening suit), page XVI of the October/November 1971 Vogue Pattern Book Magazine. Well, I can’t say I was thinking about chemistry and laundering and manners when I purchased this white cotton shirting fabric from Britex a few years ago. I just thought it was so lovely with its woven stripe and scalloped detail. I am happy to say it has been brought to fruition as a classic white blouse. While the woven stripe IS lovely, it presented some definite considerations when I was laying out my pattern. For example, what reveal of the stripe did I want to show on the collar and cuffs. What about the back yoke? How should the buttons line up on the design on the center front? The following pictures detail my decisions as I worked through each component. I chose to use the plain white band as the center portion of the cuffs. I chose to position the stripe on the collar in the middle. I decided to interface the yoke, as the cotton is lightweight, and the facing of the yoke would have shown through without it. 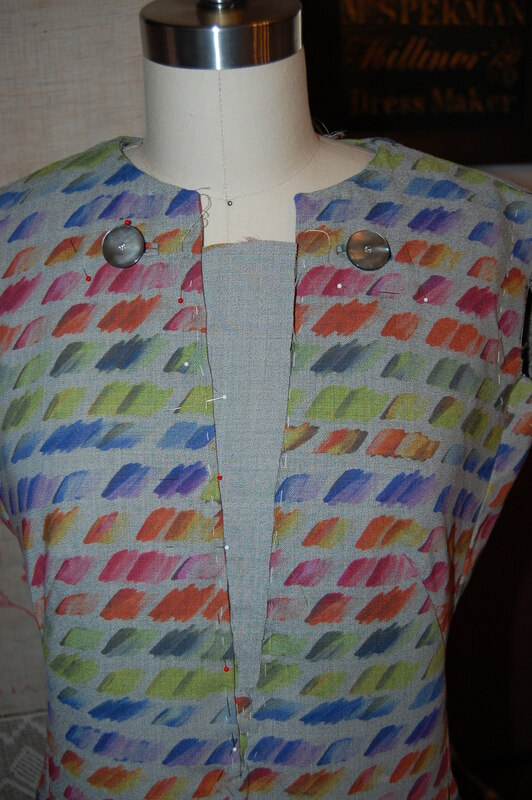 I always use a woven, sew-in interfacing when I am making blouses. It works beautifully. I evenly balanced the placement of the stripe on the yoke, with just a slight plain reveal noticeable at the lower edge. My first thought was, “How perfect! The incised stripes on the buttons mirror the stripe in the cotton. And, to seal the deal, they were also the perfect size, at 3/8”. I used the same 1970s’ Simplicity pattern (with my many alterations to it) that I used for the two gingham blouses I made over the summer. It is always satisfying to use a fabric which had been purchased – in the past, shall we say? It reinforces my thought that there is a time for all those lovely pieces of silk, wool, cotton and linen still waiting for their destination. Perhaps it really is about chemistry, after all. The A-Line silhouette is certainly a very recognizable and common style. Although there is nothing spectacular about it, it does have a rather interesting origin in modern fashion history. I had lots of time to think about this style as I worked through my most recent project, and I was surprised with what I discovered. Obviously the A-Line shape then evolved into a less dramatic, and more ubiquitous style during the 1960s and ‘70s, much closer to what we recognize today as A-Line. 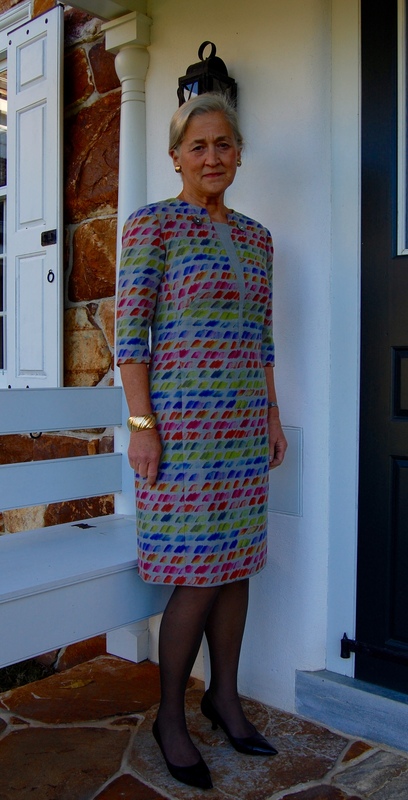 When I was contemplating which pattern to use for my dress (I had purchased the fabric, 1½ yards, 54” wide, from Mendel Goldberg Fabrics in April of this year), I wanted a style which would showcase the fabric. Although I originally thought I would go with a sheath dress silhouette for this fabric, when I found this pattern, it struck a chord. I liked that center front seam with its notched neckline, even though I knew it might be a little tricky to match the embroidered vines and flowers. However, I thought the semi-attached appliqués would be lovely overlapping the seams. The small slit in the center front neckline. It took me a full week to finish my muslin. The bust needed to be dropped so those princess-seamed darts needed a lot of adjustment. In the shoulder area I had some gaping in the front, and I also needed to reshape the top of the shoulders. Instead of easing the sleevecaps to fit the armscye, I decided to replace that ease with a shaping dart to the top of the sleeves. I really liked the fluid look that gave to the shoulder line. I drafted three-quarter sleeves as I was contemplating that change to the original pattern. It is difficult to see in this black fabric, but this is the top of the sleeve with its shaping dart. If you look closely, you can see some loose edges of the larger appliqués. Can you guess what is coming next? As is often the case when I purchase fabric first and then choose a pattern, I created a challenge for myself. It was almost immediately obvious to me that I would not be able to work on the lengthwise grain of fabric, as I could not begin to fit the pattern pieces onto the fabric and do any matching whatsoever. As luck would have it, I preferred the appearance of the meandering of the vines and flowers on the crossgrain, and I figured out how to stagger the pattern pieces to both fit the fabric, and match the seams. But those three-quarter length sleeves? No way were they going to happen! I could just fit in the original short sleeves, so short they were going to be! I ended up basting by hand every single seam on this dress. Even with great care, it was incredibly easy to catch corners of those loose appliqués by mistake, so it was much easier to make adjustments in basting rather than in the finished machine-sewn seams. The basting also showed me I needed to take out a small bit of the width of the skirt from the waist down, about an inch total. When is an inch more than an inch? In this dress! That one inch made a huge difference in its final appearance. Because I was sewing this dress using couture techniques, the neck facing was eliminated, with the black crepe de chine lining fell-stitched to the edge of the neckline. When I under-stitched the lining to secure it in place, I used an off-white silk buttonhole twist. It was so much easier to see light thread on the black lining, and also, I think it looks pretty. I hand picked the zipper, which virtually disappears in this dark jacquard embroidered fabric. I was able to arrange the hem of the skirt so the larger of the semi-attached appliqués would hang just beneath the fold-line. This shows two of the appliqués at the hemline. I love the graceful flow of this dress. The simple look of this dress belies the hours and hours I spent on it! And I am so pleased that I was unable to make three-quarter length sleeves. These short sleeves are just perfect! I am quite happy with the way this dress turned out. I do think its simple lines show off the fabric well – no need for anything too fussy when the fabric is so incredibly lovely! I love that I can wear this 1960’s A-Line style and somehow feel – and hopefully look – very current. It is a fact of sewing life that the construction of some dresses is just more difficult and time-consuming than other ones. This was a difficult dress to make and at times I really wondered just how long it would take to finish. A former owner of this pattern made the notation about the bust enlargement. 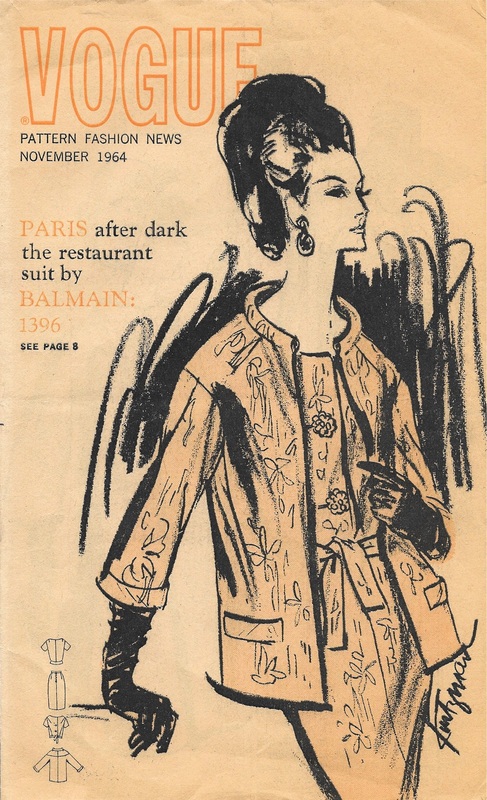 As is obvious from the envelope cover, the dress was designed by Guy Laroche (1923-1989; pronounced Ghee Lah-rush); it is copyright 1960. According to the St. James Fashion Encyclopedia, Laroche was a French couture and ready-to-wear designer who worked for Jean Desses from 1950-57. Desses was known for his intricately draped dresses, asymmetry in his designs and ornament derived from the “architecture” of the garment, according to his profile in The St. James Fashion Encyclopedia by Richard Martin, Visible Ink Press, Detroit, MI, c1997, page 100. Bingo! It appears that Laroche learned well from his time with Desses and incorporated some of the same details into his couture designs once he opened his own fashion house in 1961. Please click on the image to enlarge the print. In any event, the appeal of this pattern, for me at least, was the asymmetrical draped bodice back and the tailored bow which anchors the drape on the right shoulder of the dress. It was also these details – and others – which made it a time-consuming project. 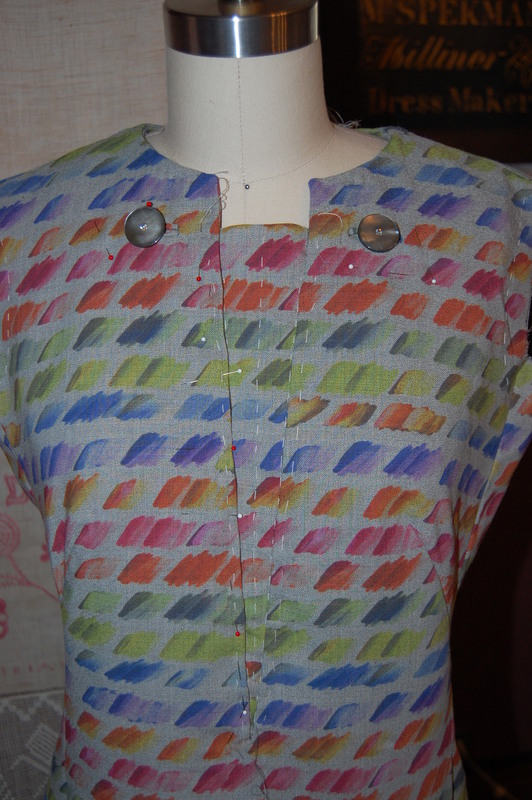 The series of dots around the waistline indicate the sewing line to anchor the dress to the lining. 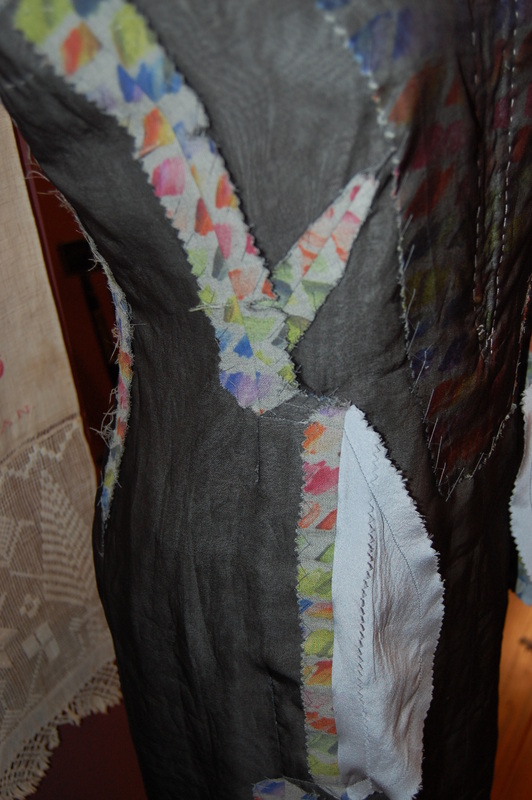 Having removed most of the blousing, I did not need to anchor the dress to its lining, so I left the lining loose. This photo shows the loose lining and also the back neckline. Ordinarily, in couture sewing, facings are eliminated. However, in this case, knowing that the weight of the drape would be added to the back neck, I chose to use the facing to add more stability. I finished its edge with Hug Snug tape. As you can see from the diagram of the lining (above), the back neckline is asymmetrical, to accommodate the attached drape on the bodice. I’m not sure why, but I found this rather confusing, resulting in sewing the lining together, first correctly, then thinking I had done it wrong, redoing it in what I thought was correct – and then realizing I had it right the first time. 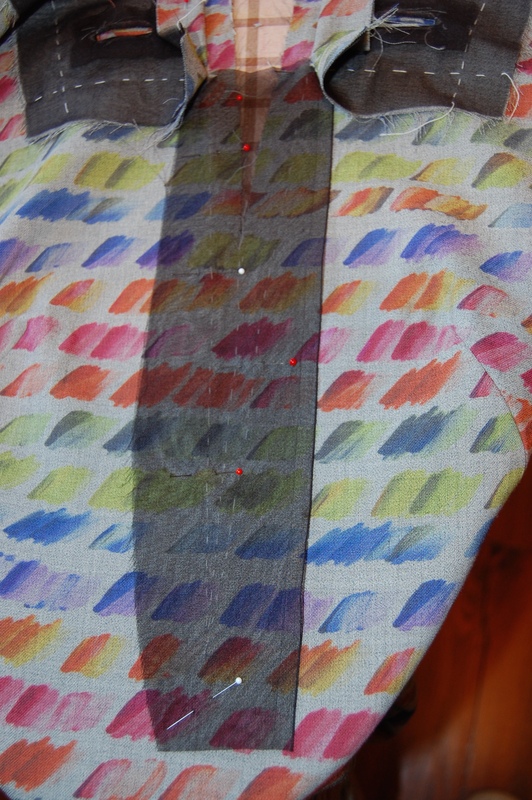 Fortunately it was easy to remove the stitching from the crepe de chine lining silk, but really? Three times? And then guess what this is? Yes, this is a backwards back bodice! Apparently I had flipped (or marked incorrectly) my silk organza underlining/pattern when I placed it on the fashion fabric, cut it out incorrectly and even had the underlining and the fashion fabric all carefully basted together. When I discovered my mistake, you can imagine my panic until I realized I had enough of the charmeuse left to cut it out again, this time correctly. Of course, then I had to baste it to the organza underlining for a second time. Tick tock, tick tock! Things then went along fine until I got to the front neckline, which presented a quandary to me. From the instruction sheet, it seemed there was to be no interior finishing of it. It appeared to be a draped version of a bateau neckline. When I tried the dress on, it was uncomfortable as it pulled too tightly from the shoulders (which did not show up in my muslin). It also did not look good. I decided the only way out of this predicament was to reshape it. I carefully basted and clipped and trimmed and clipped and trimmed some more (no photos of this, I am sorry to say. I was too intent on the task at hand to even think about photos!) But it all worked out. The front neckline certainly isn’t as draped as was intended, but I love the way it fits and looks. The lining is not supposed to be attached to the dress at the front neck, according to the instruction sheet. In order to finish the neckline without adding any bulk (which would surely show up on that wide bias expanse), I stay-stitched and then catch-stitched the raw edge to the organza underlining. Not as finished a look as I would like, but it works well. Another section of the pattern which did not present a proper interior finish for this very particular dressmaker, was the drape. It is partially gathered as you can see from the instruction sheet. #7 shows the gathering of the interior drape. As I did not care for a raw edge to be hiding under the drape, I decided to bind the edge with Hug Snug tape. This worked out so well and looks nice and tidy! Besides these time-consuming corrections and additions, there were the hours of work involved in making the bow, attaching it to the dress, and making the belt. Then when I thought I was just about finished, I remembered I needed to add lingerie keepers, due to the wide stance of the shoulders. Okay, I thought. What else?? I have decided the belt is a little loose, so I need to reset the fasteners… What else, indeed! What a good feeling of accomplishment to finish this dress and like it! Here is a detail of the bow. I do love a tailored bow! I haven’t worn it yet for any occasion, but when I do, I hope there is champagne involved, as I am going to toast myself for successfully finishing this one! If I had known how lengthy a process it is to make a couture Guipure lace skirt, I would have chosen to make it before the blouse. Here I thought I was getting the more complicated part finished first. Well, I could not have been more mistaken! However, it certainly feels good to have both finished, although I may be in “skirt recovery” for a while! The Guipure lace I used was some that I had purchased a couple of years ago. I liked the fact that the color from my fashion fabric – that coppery brown silk – would be a good contrast to the white lace. However, I did not consider if it was really the best choice for a Guipure skirt, due to the fact that part of the allure of these skirts is camouflaging the seams and darts. The light weight nature of this Guipure – and its very regular pattern – made it somewhat difficult to use for this purpose. One of the first things I did was determine what selvedge edge of the lace I wanted to use for the hem. Once I had settled that, I had to decide how much of the fashion fabric to leave showing on the hem edge. This selvedge edge is marked by some of the small daisy-like flowers in a horizontal line with the larger motifs. And here the larger motifs are more prominent.I preferred this one, but I moved it up a bit to show more of the fashion fabric, in order to “ground” the lower edge. Pinned in place, ready to stitch part of the lace covering the back seam. In trying to camouflage the zipper, I chose to have a fairly substantial flap of lace on the left, to be snapped in place on the right. It would have been better to have smaller overlays across the zipper, which are much easier to handle. The back of the skirt with all the lace attached and snapped in place. All in all, the back of the skirt looks okay, I think. And the shaping over the darts is almost imperceptible on this view of the skirt front. I have one tip to add: when I was ready to insert the silk lining, there were many fuzzies and threads clinging onto the cotton underlining. I really did not want them encased in my skirt forever, so I quickly removed them all with a lint roller. 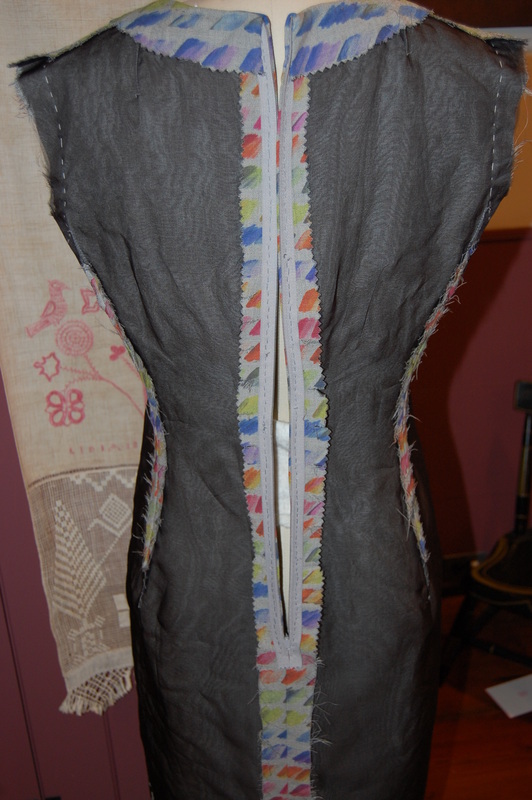 Then the lining went in just as intended, followed by the Petersham ribbon inner waist band. Here is the lining with its built-in drop pleat for ease of wearing. All in all, I am fairly pleased with how this skirt turned out. I learned so much from taking this course and making this skirt, and it probably isn’t surprising that I have a list of things to do differently the next time. 1) choose a heavier weight – or more substantial – Guipure, with a more intricate pattern. This should make it easier to hide the snaps and manipiulate the motifs in the lace to conceal all which must be concealed! The underlining cotton. A little lighter in weight would be preferable. 3) leave 1/2” distance from the top of the zipper to the line for the Petersham ribbon. I left about 3/8” and I think the zipper is a little squashed at the waistline. 4) when I tried on the skirt midway through to doublecheck on the fit, I thought the waist was a little snug, so I added 3/8”. But once the skirt was finished, I found I really did not need the extra fullness. So next time, I’ll keep my original measurement! Hopefully I won’t need suspenders to keep the skirt from falling down. 5) next time I will definitely use a more exciting lining. I think this one is dull. Now I have one more small thing to make for this outfit (with full pictures to come.) But I have small on the brain right now as I need to do some sewing for my little granddaughters, making for a fierce competiton in my sewing room. I believe multi-tasking will be on the agenda. C is for Couture . . .
. . . And Courage. I guess “C” could also be for Craftsy, come to think of it. Although I thought I would be writing only one post solely devoted to my guipure lace skirt (when finished! ), I really feel the need to address my progress and the Craftsy course which is leading the way for me. When, just a few months ago, Craftsy announced a new class by Susan Khalje, The Couture Lace Skirt, presented by Threads Magazine where Susan is a Contributing Editor, I jumped at it. 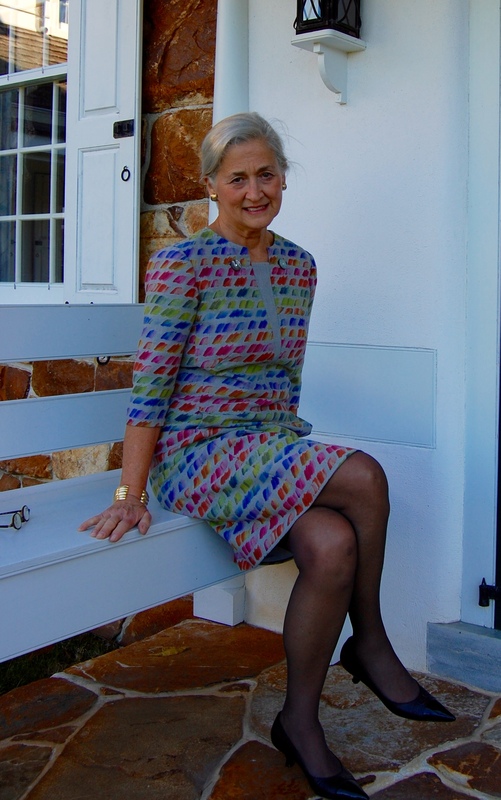 Susan has not only written about these skirts in Threads Magazine (November 2014, number 175), she has also developed her own skirt pattern – with one view expressly intended for a guipure lace skirt – and, of course, she teaches the construction of these skirts in her own classes, too. Now with this class on Craftsy, there is ample reason to feel confident in plunging ahead with the construction of one of these elegant skirts. View C is the version intended for use with Guipure lace. Although this looks like a simple straight skirt, there are subtle details which make it a step above ordinary. For example, the side seams are set slightly back from the front. There is slight fullness built in at the hip; not enough to be noticeable, but enough to make it more comfortable for wearing. This pattern is available on Susan’s website. I knew I could not go wrong with this course, but it is even better than I imagined. To look at one of these skirts, one could never imagine the amount of work in something with such a simple silhouette. About halfway through the lessons, it dawned on me that there are quite a few similarities between making one of these skirts and making a classic French jacket. Both have very specific, and unusual, construction techniques. Both defy many of the normal sewing rules. Both have a tremendous amount of handwork involved. 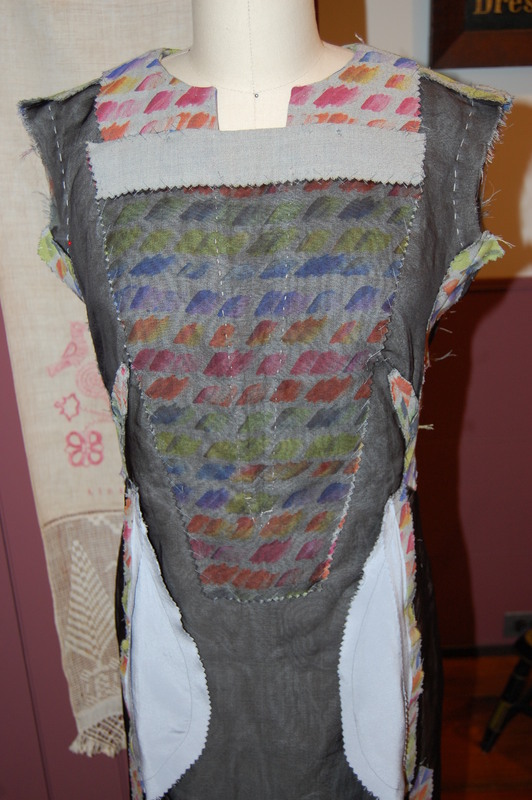 And both garments go through a really messy stage – almost chaotic! – before emerging in their final manifestation. Here is one of the skirts illustrated in the Threads article from November 2014. The course has ten parts, and although it is a couture sewing course, Susan’s directions can be implemented by someone with no couture construction experience. However, patience is a must. She walks you through the making and fitting of a toile, followed by preparation of the underlining and fashion fabric (the fabric which peeks through the lace, usually silk charmeuse), then the sewing of the side seams (only) and hem. I had never worked on a skirt where the back seam is not sewn until so far into the construction process, but such is necessary to provide a flat surface on which to shape and attach the lace overlay. Another example of one of these skirts, from the Threads article. This is where Courage comes in. Shaping the lace to lie properly on curves and darts requires a good amount of snipping and clipping and cutting of the lace! This is not for the faint of heart, but once you get into the process, it really is logical and even captivating. Besides, as Susan says, if you make a mistake, you can always patch! A detail from my skirt, with the lace pinned and ready to attach. This is also the part that looks somewhat chaotic, with great flaps of lace waiting to be tamed, and a crazy network of tiny stitches emerging on the underlining, but invisible on top. One section of the underlining cotton showing the maze of stitching required to attach the lace to the top of the skirt. Leaving the basting stitches in helps to orient the lace properly. I am about ready to insert the hand-picked zipper, which will be hidden when finished. What an interesting process this has been so far. Susan has so much sewing wisdom to impart, and she does it in such an engaging way, that it is like having your own personal couture teacher right by your side. If you have ever admired these skirts and thought about making one, you will find this course to be invaluable! More on my skirt to follow in the next post on Fifty Dresses. These opinions are my own. I purchased my subscription to the course on Craftsy and have no affiliation with the company. Can a Coat be Glamorous? And what exactly is glamour? A recent quote by Carolina Herrera – “It’s important for women to feel glamorous and feminine but always themselves” – prompted me to look up the definition of the word “glamour” – and I was surprised by what I found. Here is how Webster’s defines it in its noun form: 1) the quality of fascinating, alluring, or attracting, esp. by a combination of charm and good looks 2) excitement, adventure, and unusual activity, like the glamour of being an explorer 3) magic or enchantment; spell; witchery. And then there is the definition of “glamorous”: 1) full of glamour; fascinatingly attractive; alluring 2) full of excitement, adventure , and unusual activity: to have a glamorous job. One of the things I love about this book is that it covers all sorts of situations. Square shoulders for Raglan sleeves? Not a problem. The diagrams take the guess work out of alterations to patterns. Once I had my muslin adjusted, my silk organza interlining marked and cut (to be used as the pattern for the wool), I felt like I was off to the races. Not so fast. A careful steaming of my wool fabric revealed three small “thin” areas (not holes, but thin enough that I would need to work around them). This is not unusual for vintage fabric, and is one of the reasons why a careful pre-steaming or pre-pressing of any fabric is important, but especially so for vintage goods. I marked these small imperfections with yellow chalk. And then double-marked the areas with orange post-its when I was arranging the pattern pieces. After untold hours of basting the layers of silk organza and fashion fabric together, I was finally ready to sew. And this is when I think it began to get glamorous. The first major details to be completed were the pocket plackets. I thought I might faint when I had to make that first cut into one of the side panels of the coat front. But bravery saw me through! I have the placket catch-stitched temporarily so it does not get caught on something while I finish the remainder of the coat. Here is the inside of the pocket and placket. With the first pocket and pocket placket successfully completed, the second pocket placket was simply fascinating and alluring, my progress encouraged by the charm and good looks of the first one. Definitely glamorous! Progress – both pockets/plackets finished! More seams ensued, each one carefully pinned, sewn, pressed and catch-stitched. 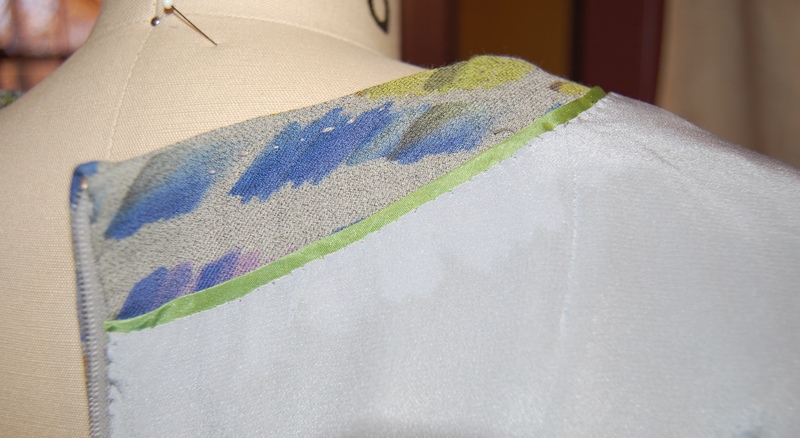 Particularly rewarding were the shoulder seams of the raglan sleeves. Properly clipped, pressed and catch-stitched, the seams lie beautifully and look good, too. The benefits of a silk organza interlining (or underlining) are manifold, not least of which is a foundation upon which to secure the seams. Although I have many more hours to go with the construction of this coat, I can’t help but feel that not only is this coat going to be glamorous, with its elegant gray cashmere, its vintage sensibility and all its hidden, inside secrets used to tame those seams, it is also going to be feminine and definitely me. Perhaps the next question to ask is “Can sewing be glamorous?” It is “fascinatingly attractive, full of excitement, adventure and unusual activity.” It is magical and enchanting, too. The answer would have to be, “Yes, sewing most definitely can be very glamorous!” Even when we are in our bedroom slippers and blue jeans, covered in threads and pins, if we are sewing, I say we are glamorous. The trickery, which defined my October sewing, finally floated away with the leaves and the goblins, leaving sweet November with her welcome reward, a new dress for Autumn and Winter. 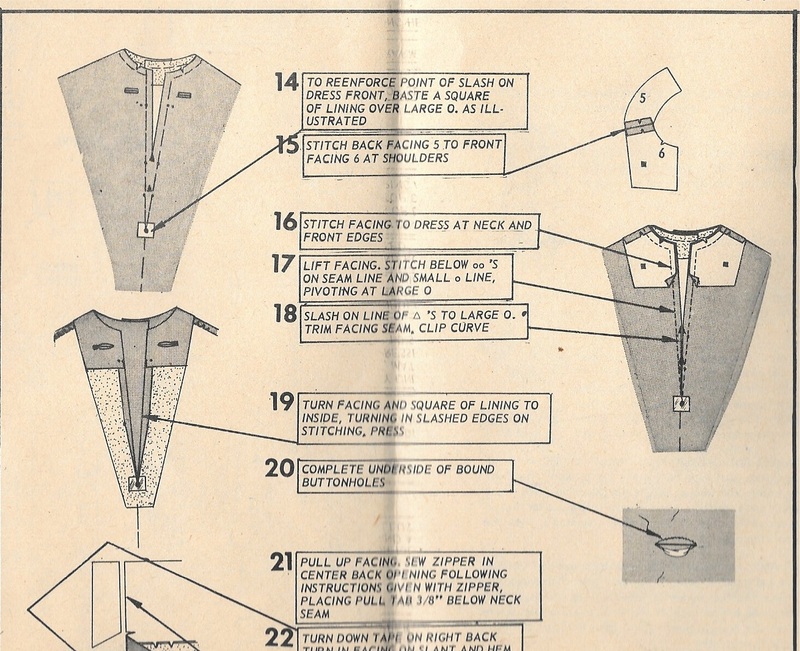 So what made vintage Vogue 1395 such a tricky dress to make? I documented my efforts to get a workable muslin (toile) in a post from early October. Once I had my adjusted muslin pattern, I transferred it onto black silk organza to use as my cutting guide. It was then I realized that, because the design on the fabric, a silk and wool blend, was printed on it, not woven into it, I needed to work from the right side of the fabric in order to match the horizontal “lines.” This meant that I had to flip every piece that I cut out and then exchange the organza with its opposing side. (I hope this makes sense.) It added a bit of uncertainty to the process and I was fanatical with flipping and checking to make sure I kept the design in line. Something told me I should delay cutting out the sleeves until I had the body of the dress together – my sewing godmother at work, I guess – and I am glad I did, as I’ll detail in a bit. I had made the decision at the beginning of the project to cover the dress’s two buttons in the plain gray “wrong” side of the fabric. But once I “semi-made” a covered button, and tried it out, it was DULL. It added nothing to the dress. I went to my button box and all I could find was a small gray pearl that was close in color. 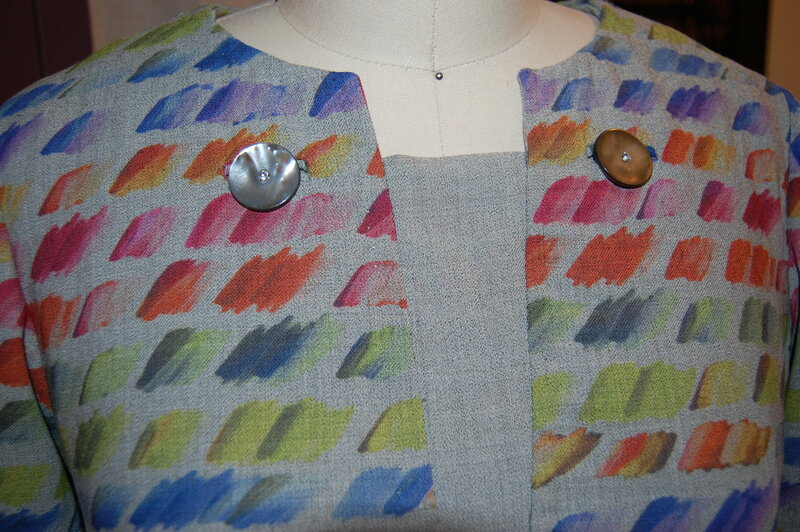 But I loved the iridescence of it and determined that gray pearl buttons were what I needed. I seem to have such good luck with buttons from Britex – even though I am ordering online – and found 1” gray pearl buttons with a rhinestone in their centers. Although I am not a rhinestone-y type of person, something about them spoke to me. I remembered what Susan Khalje said in one of the classes I have taken with her – that couture often has a bit of “whimsy” to it. Well, I ordered those buttons as as fast as I could! I think they are just what was needed! There was not enough definition between the dress and dickey to make it interesting. I cut some scraps to see what it would look like with a play gray insert – and it was so much better! So – I took the dickey all apart and flipped it over so it would be out of the plain gray “wrong side.” By now I was enjoying the versatility of this fabric (which I bought online from Mendel Goldberg Fabrics) and appreciating the serendipity of having this fabric for this pattern, giving me options. The instructions directed me to just turn back the seam allowance, but because of the ravel-ly nature of the fabric, I was certain it would pull out with wear. Instead, I opted to make a “facing” for the opening out of black organza. It is situations like this that make me feel so fortunate to have enough “sewing sense” to be able to recognize potential difficulties and then have the ability to work out creative solutions to them. Silk organza pinned in place. And here it is sewn in place. Yes, those are pockets hanging on the front. This shows those bust darts with their slanted orientation. The zipper is inserted by hand, as usual! Once I had it basted in place, I tried the dress on for fit and determined I had to take it in a bit at the waistline. Then I tackled the sleeves. I had quite a time determining how to place the sleeve patterns on the remaining fabric. 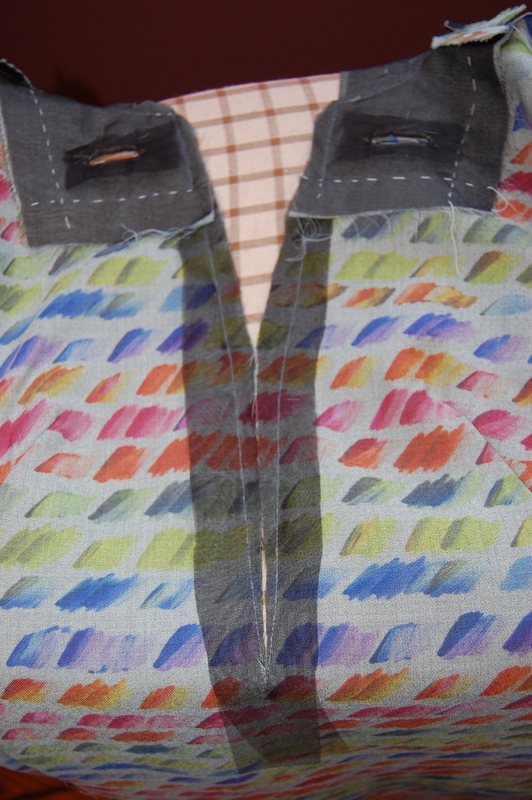 Some of those horizontal lines of “paintbrush strokes” change color across the fabric! And my adapted sleeve pattern has two elbow darts, which changed the horizontal line. I had to make a decision about where I wanted the best match to be, as I determined I could not match it across and up and down as I would normally want to do. I opted for a match across the shoulders – and I now believe that was the best decision. 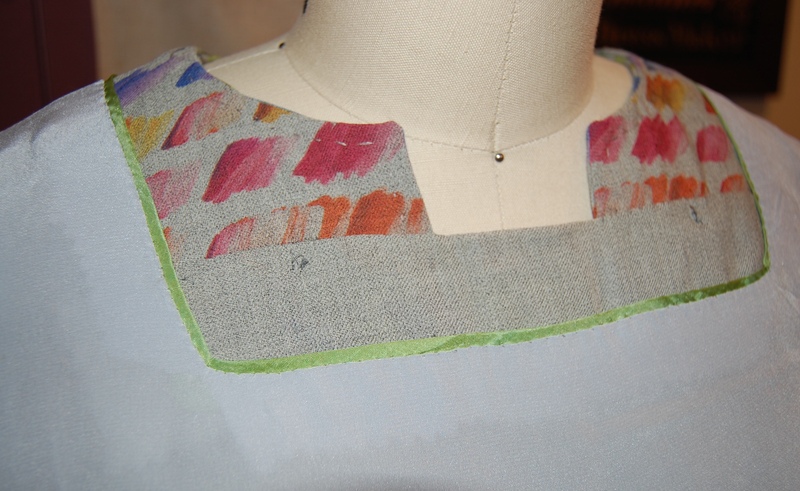 I also added a soft “cigarette” sleeve heading to each shoulder seam. 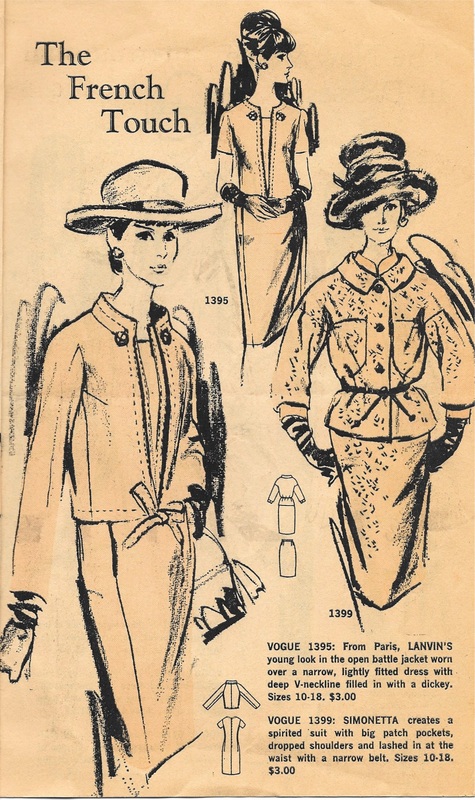 Next to the lining – and bless those vintage Vogue patterns – the lining for this dress included separate and distinct pattern pieces. I made the sizing and dart changes to the lining (in keeping with the dress) and it went together effortlessly. When I got to the point of inserting the lining by hand, I just could not resist adding silk piping to the inside neck edge. I know I am the only one who will ever see it, but it makes me happy! I used a bias strip of lightweight silk for the piping. How wonderful to have this dress completed! The buttons really show in this picture. Inside on page 3 is, yes, my dress! Just imagine – 51 years ago this month, this dress made its debut. Happy Sweet November Everyone!